Unlike many other MMO games, Albion Online is mainly driven by players' willingness and self-drive. Questlines does not exist in this game. As you advance, you are left entirely to yourself. However, this does not mean that you have to do this completely without motivation and pathfinding assistance. One of the basic motifs of Albion is "You are what you wear". Without a fixed class system in the game, your equipment and its effects determine what role you play in the game. You prefer to play healers, but you cannot see any more wave cloths? No problem, just carry plate arms. Which combination you dress for is up to you. This is possible for both solo and group constellations. So you already know in advance which paths you should focus on in the destiny tree in order to be able to use the objects you have selected. In addition to the combinations you have created, the Character Builder also gives you access to the equipment combinations created by other players. You can sort these via some quick selection fields. Find the character builder on the official Albion Online site. 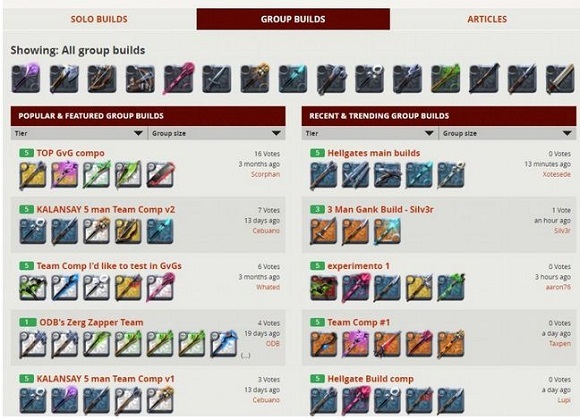 In order to create and upload your own creations you also need an account in the official forum of the game and you must be a founder or starter pack of the game.